Every time the garden and flower beds get cleaned, wait a few days especially after another one of our rains, and a new batch of weed seedlings appears like magic. Weeds are very opportunistic, taking advantage of smallest open space in any garden and can germinate quickly. What is typical and expected is that the annuals and perennials grow their canopies into those open areas and provide the shade that will prevent weed seeds from growing. We would only have to weed a couple of times before the ornamentals take over. Some perennials suffered from last seasons' drought, so canopy cover can be slower or maybe some plants died all together leaving some spots wide open. Something else that has been showing up more this season is finding perennial and annual weeds growing up through the base of perennials. There is not a lot that can be done but carefully pull them. When you see those seedlings just getting started, that will be the best time to deal with them. If you are going to hoe them out, do so in a very shallow manner by just scraping the weed seedlings off and do not cut into the soil deeply. There are thousands of seeds in a cubic foot of soil, so the deeper you hoe or cultivate the more you introduce new seeds to germinate later. Another part of this kind of weeding is creating something called a stale seed bed. This means that after you only work the ¼ inch of soil or so several times, you have caused all the weed seeds to germinate in that ¼ inch of soil and from that point very few weeds will show up. Another tactic that works is covering the soil that has the weed seeds present with an organic matter product that has been processed with heat to provide a weed seed free material. You use this material as mulch and by doing so; prevent most the seeds in the soil from germinating. At the end of the season, that material has already decomposed or you turn it in as part of your fall tillage. 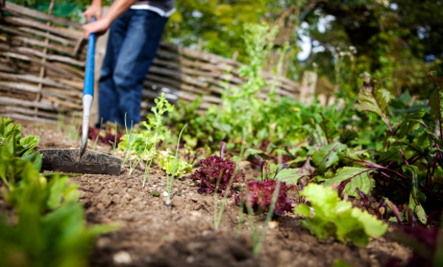 If you enjoy the time you spend in the garden and like to get up close and personal with your vegetables and flowers, you can take your time and pull those seedlings or use a small garden tool to dislodge them without disturbing much soil. Weed seedlings that get disturbed quickly die, even if not entirely removed from the soil. Since our gardens contain many kinds of vegetables and flowers, it is difficult to find a pre-emergence herbicide product that can be applied and not harm some of the plants we are growing. As a reminder, pre-emergence products only stop weed seeds that have yet to begin to grow. Weeds that are already there and weed seeds that have been growing for even a few days will typically not be stopped. The part of putting down this type of herbicide is that the bed has to be weed free to start with.